What does the research show about education and cities? What about those with less education? Who are the young and restless? Why are the young and restless economically important? How do the Young and Restless differ from GenX and Millenials? How mobile are the young and restless? What factors are most important to the Young and Restless in choosing where they'll live? Which cities have the most young and restless? Where are young and restless moving? Don’t the young and restless just move away when they age? Are the Young and Restless the same as the Creative Class? Isn’t “Young and Restless” a soap opera? The single most important factor driving urban economic success is the educational attainment of a city’s population. Statistically, educational attainment–summarized by the fraction of the adult population with a four-year college degree–explains roughly 60 percent of the variation in per capita incomes among large U.S. metropolitan areas. No other single factor comes close. This chart is the first, most important thing to remember about urban economic development in the 21st century: if you want high incomes, you need to have a high level of skills. Cities with poorly educated populations will find it difficult to raise living standards in a world where productivity and pay depend increasingly on knowledge. Data for this chart are drawn from the American Community Survey (educational attainment) and from the Bureau of Economic Analysis (per capita income). The four-year college attainment rate is a proxy for the overall skill level of the population. A wealth of research shows that human capital—the knowledge and skills of a region’s population—is the biggest single determinant of its economic success. Economists commonly use educational attainment as a proxy for the skill level of the population. Statistically, the fraction of the adult population that has completed at least a four-year college degree is strongly correlated with many measures of economic success, including unemployment rates, wages and income levels. “Today human capital is the best predictor of high salaries for both individuals and communities . . . The presence of many college-educated residents changes the local economy in profound ways, affecting both the kind of jobs available to residents and the productivity of all workers. In the end, this results in high wages not just for the skilled workers but for workers with limited skills.”(p. 90). My results suggest, echoing the work of other scholars, that growth in educational attainment is a major factor driving the health of urban labor markets. They also indicate that high rates of growth in educational attainment (human capital “flows”) are a more reliable contributor to growth than initial levels of educational attainment in the population (“stocks”). In the aggregate, cities in which the number of bachelor’s degree holders grew had higher employment growth and lower unemployment rates across this time period than did their peers. The implication is that policymakers’ deliberate and aggressive policies to increase the number of bachelor’s degree holders within their cities’ populations are not misplaced. Initiatives to harness the capabilities and resources of academic institutions, efforts to create amenity-rich neighborhoods that attract and retain college-educated professionals, and investments in increasing college attainment among incumbent residents all have the potential to reduce joblessness in places where unemployment rates remain in the double digits nearly four years after the official end of the recession. It’s clear that educational attainment matter to city success, and that cities with lots of well-educated people have higher average earnings. But what about those with lower levels of educational attainment? How do they benefit from living in cities with higher educational attainment? It turns out that education has important spillover or social benefits in local economies. Simply put, having well-educated neighbors increases economic activity in an area, resulting in lower unemployment and higher incomes–even for those persons with lower levels of education. In analyzing the economic effects of the Great Recession, Harvard economist Ed Glaeser found that unemployment rates for less skilled workers were lower in cities with a higher level of educational attainment. Careful studies of wage rates among U.S. metro areas show that average earnings for less skilled workers are higher in cities with higher overall levels of educational attainment. The young and restless are 25 to 34 year-olds who have at least a four-year college degree. We call them “young and restless” because well-educated people in their late twenties to early thirties are statistically the most likely to move across state lines of any adults. Where these talented young workers choose to live can have a big impact on local economies. There are about 13.2 million 25 to 34 year olds with a four year degree or higher. They represent about 32.2 percent of all persons in this age group in the United States. Because the current generation is numerically larger than its predecessor, and because college attainment rates are increasing, the number of young and restless adults has increased about 20 percent over the past decade, from about 10.9 million in 2000. We know that talent is the biggest single factor explaining metropolitan economic success. Statistically, we can explain 60 percent of the variation in metro per capita incomes just by knowing what fraction of the adult population has a four year degree. Because the young and restless are so mobile, where they move can have a big impact on a region’s overall educational attainment. The young and restless play an important role in the labor market for several interconnected reasons. First, they have what economist’s call “recent vintage human capital”—they’ve completed their formal education more recently and may have skills and traits (particularly technologically adeptness) that make them especially useful. Second, because they are just starting their career’s they are more flexible than older workers who’ve invested in a specific career path and developed narrower specializations. Third, because they’re less experienced than older workers, they generally command lower wages—making them attractive to employers. GenX and GenY and the millenials—like the Baby Boomers and “Greatest Generation” before them—are references to what demographers call “birth cohorts”—people born in a particular set of years. Boomers were born between 1946 and 1964, for example. The young and restless refers to a specific age group (and also educational attainment status). The young and restless are 25 to 34 year olds with at least a four-year college degree. In 2000, the young and restless were college graduates who had been born between 1966 and 1976—the so-called Generation X. In 2012, 25 to 34 year olds were born between 1978 and 1987, the so-called millennial generation. Every birth cohort has its “young and restless”years—this is when they are most mobile. As different generations move through their young and restless years, the number of well-educated young adults changes. As baby boomers aged out of this cohort in the 1990s, the number of 25 to 34 year olds declined; in the past decade, the number of 25-34 year olds, and the number with a four-year degree has increased. Well-educated young adults are statistically the most mobile people in our society. The likelihood of moving across state lines—a key indicator of long distance moves, peaks at about age 24. This figure from our Young and Restless Report shows that more than a million college educated 25 to 34 year olds move across state lines each year, according to data from the American Community Survey. The overall migration rate—the percentage of the U.S. population moving from one state to another—has been declining slowly but steadily for decades. 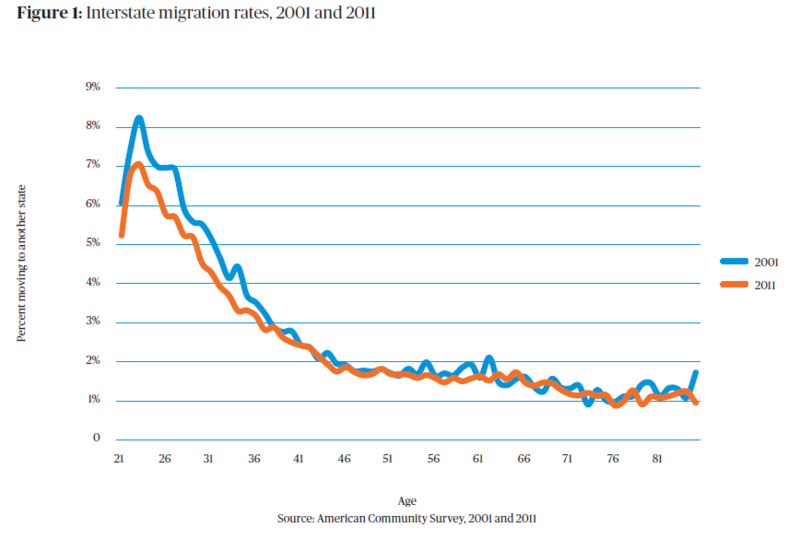 Some, but not all this decline has been fueled by the aging of the population (migration rates decline as we age). Scholars are still exploring the reasons fueling the decline. There are many competing explanations for declining mobility—the increasing similarity of occupations and convergence of wages among regions, diminishing incentives to migrate (Kaplan & Schulhofer-Wohl, 2012), and a decrease in job churn and a greater importance of internal labor markets to career advancement (Molloy, Smith, & Wozniak, 2013). Still, 25 to 34 year-olds are the most mobile adults. According to the American Community Survey, about 6.7 percent of 25 year olds moved to a different state in the last year, making them twice as likely as 35 year olds (3.4 percent), and three times as likely as 45 year olds (2.2 percent) to make an interstate move. Traditionally, we’ve thought of migration decisions as being strongly motivated by employment availability and career aspirations. But among today’s young and restless, there’s a strong preference for quality of place. Asked to choose between “moving to where job prospects were best” or “choosing where I want to live, and looking for a job there,” college educated young adults chose the latter statement by two to one margin in surveys conducted in 2005 and 2013. Relative to the size of their populations, four metropolitan areas—Washington, San Francisco, Boston and San Jose–are the leaders in young and restless. Young adults in these cities are very highly educated, and well-educated young adults make up a larger share of the population. In these four cities, half or more of all 25 to 34 year olds have completed at least a four-year college degree, compared with about 30 percent nationally. In each of these cities, and in Austin, college-educated 25 to 34 year olds make up at least 7.5 percent of the population. All of these cities also recorded increases both in the college attainment rate of this age group, and the share of the population in this demographic group, over the past decade. At the other end of the spectrum, San Antonio, Las Vegas and Riverside have the lowest levels of college attainment among 25 to 34 year olds (less than 25 percent in each case), even though in each instance college attainment rates have increased for this age group over the past decade. To check out how your city measures up, go to our post here, which includes interactive tables and a map describing the migration of the young and restless. Increasingly, young adults are moving to urban centers, especially the close-in neighborhoods within 3 miles of the center of the central business district. In the nation’s 51 largest metropolitan areas, since 2000, the number of well-educated young adults living in close-in urban neighborhoods has increased by 37 percent, even as those neighborhoods stayed essentially unchanged in total population (down 0.2%). The number of 25 to 34 year olds with a four-year degree increased from about 800,000 in 2000 to 1,100,000 in 2010. The number of well-educated young adults increased about twice as fast, in the aggregate, in close-in urban neighborhoods (37 percent) as they did in large metropolitan areas as a whole (19 percent). The young and restless are increasingly showing a preference for living in close-in urban neighborhoods, compared to other demographic groups. College-educated 25 to 34 year olds were 77 percent more likely to live in these neighborhoods in 2000, and 126 percent more likely than other metro area residents to live in these neighborhoods in 2010. As young adults age, their probability of moving, particularly moving long distances, falls sharply. A 35 year old is less than half as likely to move as a 25 year old. As they grow older, young adults find partners, have children, buy homes, and progress in their careers—all factors that decrease their likelihood of moving, especially outside a given labor market. The practical implication is that the biggest pool of talented workers that is mobile and up for grabs at any particular time, is these young, well-educated adults. The creative class—a term popularized by Richard Florida—refers to persons in a set of occupations that typically involve creative activity: art, writing, design, theatre, engineering, many management occupations, science and so on. Persons in the creative class can be of any age and have any level of education. Statistically, creative class workers are more likely to have a college degree than other workers. And many of the examples Florida cites in “The Rise of the Creative Class” are younger adults. So while there is some overlap between the two groups, they are different. Yes, that too. “The Young and the Restless” has been running on television since 1973–meaning that its now 41 years old, and technically, out of our “young and restless” demographic group.” The venerable series has had more than 10,000 episodes and earned more than 100 daytime Emmys.